Apart from the miners who formed the backbone of all the operations at Alderley, a number of other named people feature and on this page, biographies will be found for these people. Some are fairly detailed, others very brief but all should enable the reader to find where a named person fits into the history of Alderley. A long list of named miners from the 1860s is contained on the page with mining employment data. In some cases, there are detailed articles available with references but these have been excluded on this page. If you want to see the fuller versions, contact the Webmaster. * For copies of the biographies with references included, please contact the Webmaster. Also, we would be very interested if anyone can correct, clarify or add to the information on this page. First hand accounts are almost universally absent so most of the data has been gleaned from censuses, gazettes, newspaper articles and so on. Director of Mottram St Andrew Mining Company Limited in 1862. There was a William Adshead who was a silk dyer and Mayor of Macclesfield in 1852; he died in 1869. Miner in 1805 period. Came from Derbyshire where the name Ashton is reasonably common around the Castleton area. He had a share in the 1805 mine earning his shares through his work. A couple of years later, he was unable to buy a further shares when the company needed new capital so he was probably the victim of a bit of a 'con'. Was a director of the company in 1867. There was a William Bullock JP who was a silk merchant in Macclesfield and it is probable that this is the same person. See also William Adshead. Thomas Cooper wasn't a leading light but the history just contained in the census record is interesting. In 1835, he was born near Chesterfield in Derbyshire. In 1851, he was still living with his family (his father was a miner) but he was already an engine driver at the age of 16. By 1861, he had married Mary (born 4 years before him) and was living at Alderley Edge as an engine driver again. Mary was from Crew's Hole in Bristol so it is highly probable that Thomas went with Michell from Stonedge to Crew's Hole and then back to Alderley. In 1871 he had moved to Widnes and was engine driver at a copper works, without doubt the one set up by Henderson and run by Jonathan Down. Then in 1881, his wife is a widow as he had died in 1872 at the age of 38. Mine agent in 1860s. He was born in Calstock in Cornwall in about 1824. In 1851, he was a lead smelter living in Derbyshire. Lived Bradford Lodge in 1861 with his wife Mary (born about 1825 in Bristol, near Crew’s Hole). Two sons born in Gloucestershire 1856 and Cheshire 1860. Mine agent for the Alderley Edge Mining Company in 1860s. Named in Mining Journal 1860, p.686, in 1863 and in 1864. He was linked with William Henderson in the patents arising from improvements to the copper extraction process. In 1871, he was living on his own in Widnes as a widower and as agent at copper works. He was the manager of the Lancashire works of the Tharsis Sulphur & Copper Co Ltd (see Henderson's biography), established in Widnes in 1870. The company was taken over by the Lancashire Metal Co Ltd in 1885. This in turn was acquired by the forerunners of ICI in 1894 and closed in 1927. Was a director of the company in 1867. No other information. Director from start. Gave name to Gard's Shaft. May be same as Edward Gard MP from Exeter who invested in Devon Consols and gave his name to a shaft there. Alternatively, he may be Edward Oram Gard (c. 1825 - 1880) from Devonport, who was a solicitor. There is a reference elsewhere to Gard's shaft in Devon being named after a Richard Gard. More information needed. William Henderson was born at Westmuir in Scotland in 1827. His father was a builder, James Henderson, and his mother Agnes Henderson. He moved to London some time before 1851 and married Esther (or Ester or Hester) Glassborow on 6 May 1849 at Trinity Church, Stepney, Middlesex. Esther was born in Limehouse in about 1828. In 1851, he was living at 6 Randall Street, Poplar, London with his wife and eldest son, James, born about 1850. He was described in the census as “Smelter and Refiner”. He spent some time between 1851 and 1861 living in Bristol which is of course where James Michell was living from 1853 until his death. Esther junior was christened on 03 August 1856 at Temple, Bristol and Emma Louisa was born on 27 February 1857 and christened on 23 August 1858 at St Andrew's, Clifton, Bristol. In this period, he was working with John Wilson and formed the Bridgewater Smelting Company (Merseyside) and was associated with the Cornwall and Devon Sulphuric Acid Company. We can only assume that during this time he met Michell and possibly was involved in the Crews Hole venture (see Michell’s biography). By 1858, he had patented a process to extract copper from cinders using material from Tennant’s factory in Glasgow and this would have led to the process for the Alderley ores. At this time, Henderson also became involved in the Tharsis mines and processing the pyritic ore with his wet method. In 1865 he built works on the Tyne, in Lancashire, Staffordshire, South Wales and Glasgow to exploit the processes. Henderson also became a director of the Tharsis Company until a dispute with the shareholders leading up to August 1870 when he resigned. During the 1860s, the family moved back to Scotland as in 1871 they were living at Erskine in Renfrewshire. By this time, they had added Ada Blancke (1866), Arthur (1868) and Albert Norman (1870). They also had a cook and two housemaids. William Henderson is described in the census as a shareholder in copper mines (transcribed erroneously as a "shoebinder") and had also founded (1872) his own metal extraction works at Irvine in Western Scotland. At this time, a mine was operating just south of Gourock working copper in the form of malachite in sandstone and this may have fed material to his Irvine works. William Henderson’s education has not been researched but he described himself as "chemist" when he married in London in 1850. By 1860, when he was in Alderley Edge, he was also described as a "chemist" on the 1861 census and is recorded as being "William Henderson of Glasgow" when he invented in 1859 a process for roasting pyrites with salt and washing the copper out with water. He is accredited with having introduced the wet method to copper extraction along with J A Phillips (date unknown). Henderson’s patents covered the treatment of ores by chemical methods in 1857 (No 2517), the use of sodium chloride and other chlorides which he patented in 1859 (No 2900) and 1860 (No 2525). He also proposed use of chlorine gas in refining in 1849 (No 12534). In 1861, Henderson is mentioned in connection with the meeting of the British Association for the Advancement of Science when it met in Manchester. Henderson is not mentioned at Alderley Edge after he writes to the Mining Journal in 1863 but he is associated with plants in South Australia from 1866 to 1877. In 1866, he agreed to a Canadian patent taken out by Casimir Stanislaus Gzowski. Research into old chemical industry journals has not thrown up any more information about William Henderson. Miner who became agent by 1866 (Jonathan Down was agent in 1864) and Secretary and Manager by 1867. He subsequently became liquidator in 1878 after the mine closed in 1877. He died in 1905 after serving as school manager, parish councillor and churchwarden. The obituary says he was manager of the Alderley mines for 20 years but this is probably an exaggeration. Miner, agent, who probably left his initials in Brynlow in 1866. Named as Captain in Mining Journal 1866. Was a miner living at Mottram St Andrew in 1861 but had moved to Nether Alderley as Agent in 1871. He is also named (as Leeman) in Railton and Maltby's account of visiting the mines as juveniles. ames Michell was born in Tresavean, nr. Gwennap, Cornwall in 1796. There were many Michells in Cornwall, many in Gwennap and most of them miners at that time so distinguishing this James Michell from the others is not easy. However, it seems probable that the James Michell who started the Alderley Edge Mining Company in 1857/8 was christened on 26 July 1796 at Gwennap of parents James (b. c. 1770) and Mary Michell (b. c. 1774) both of Gwennap as well. He was the eldest of eight sons named James, Edmund, Joseph, Henry, John, Richard, Frederick and William with birthdates between 1796 and 1813. He married Lovdy Lakes Geach on 30 November 1824 at St Austell from where she came (born 16 June 1784 ). Her names are variously spelt Lovdy, Lovedy or Loveday and Lakes or Lakas in the transcriptions studied. In 1841, there is a Mary Michell, widow, living with two sons in Gwennap with the right age but identifying the subjects from the census is not easy when there are, as in the case of Gwennap, 18 Mary Michells to choose from. The sons are named as Jos. (probably Joseph) who is a Mine Agent and Rd. (Richard) who is a copper miner. In 1835, James Michell of Truro is recorded as having patented an improved process in smelting argentiferous ores. Given his future career, this is almost certainly the same Michell. James Michell was not recorded in England in 1841 but his wife was at Old Weston Turnpike, St Austell with her niece Eliza Lanyon and Anna Lanyon. The Lanyon name crops up again so it is probably the surname of Lovedy Michell's brother-in-law. It is almost certain that James was in Spain where he was probably Managing Director of the San Ramo factory at Almagrera in Almeria where many British miners were working deposits of iron and lead. He wrote a paper about the Spanish lead mines in the Transactions of the Royal Geological Society of Cornwall. In 1849 or thereabouts, he introduced the Spanish Slag Hearth to the lead smelting cupola at Stonedge, south west of Chesterfield. As a result, in 1851, James Michell was in Thornfield House in Newbold and Dunston parish, on the western outskirts of Chesterfield, where he was described as a Lead Smelter. Later, in 1861, he described himself as a 'mineral assayist' which might have been the starting point for his career and links in with the later moves. He was accompanied by his wife and her niece Emma Lanyon and three servants, showing that he was reasonably affluent by this time. Michell became involved in 1853 with the old copper works at Crew's Hole in southern Bristol where he hoped to recover metal wasted in the 18th century from the slags. Unfortunately, he found that later slag contained less metal, overlaid the older slag and prevented its efficient working. As a result, Michell ceased trading and went bankrupt in 1856 when he was described as 'James Michell, Crews Hole, and Westbury-upon-Trym, Gloucestershire, lead smelter'. He appears to have teamed up with Henderson at this time as Henderson was in Bristol from 1856 onwards. In 1857, Michell came to Alderley Edge and negotiated a lease from the Stanleys. The first lease was dated 12 April 1858 and was supplemented by a further lease dated 5 May 1859. This latter lease was granted to James Michell. He became one of the three directors (with Edward Gard, who may have been a Devon solicitor at the time and Samuel Rowe Sanders accountant who is discussed in the next paragraph) and signed shares issued in 1862 (his signature is shown above). In 1861, James Michell was living at Westbury-on-Trym outside Bristol at The Hermitage. Lovedy Michell had died by now and James Michell was living with her niece Emma Lanyon while another niece, Eliza Lanyon, was visiting. All three of James Michell and the two nieces are described as Proprietors of Copper and Lead Mines. Also visiting them were Anna Geach, presumably another relative of Lovedy Michell nee Geach and Sarah Sanders who from an 1871 census turns out to be Anna's sister. Samuel Rowe Sanders was one of the first three Directors of Alderley Edge Mining Company Limited and on the 1851 census, he was an Iron Works Cashier at Kimberworth in Yorkshire with Sarah and yet another Geach, Grace, who was an 8 year old scholar at the time. James Michell died in November 1862 when he "accidentally fell 23 feet down into a Copper Mine and died from Concussion" during an inspection of the mines. It is believed that he is buried near his Westbury-on-Trym, Bristol, home. Note that James Michell should not be confused with James F. Michell who was Secretary in 1862. Some more information about James Michell is available on the Michell-Mitchell website. This Michell must not be mistaken for James Michell (b.1796). James F Michell was secretary to the mines when the shares were issued in 1862 and also in 1863 when an advertisement was placed for a Mine Agent. His signature is shown to the left. There is no historical reference to this person by name in connection with the mines. By combining records about the Devon and Cornwall Michells with census information, the following is deduced. All of the above were born in Gwennap, Cornwall. Frederick married Elizabeth Whitburn on 3 July 1833 in Gwennap and had two children, James Frederick (our subject) and Joseph Henry who lived from 1839 to 1942 dying in Gwennap at the age of 103. James Frederick Michell was born in 1835 but no records have turned up of his baptism. His father appears to have been gaoled between November 1837 and March 1838 when he was described as a Mine Agent. There is no trace so far of his death or that of his wife in the censuses from 1841 onwards. In 1841, JF and JH Michell are listed as 5 and 2 years old respectively living with an innkeeper Stephen Whitburn, quite possibly JFM’s grandfather on the maternal side or else an uncle. There is no trace on the census of Frederick Michell although two of his brothers are living with Mary, their mother. Joseph is listed as a mine agent and Richard as a mine captain showing that the family were above the level of basic miners. In 1851, JFM is living with his grandmother Mary, and his two uncles Joseph and Richard. Joseph is now farmer and copper miner while Richard is a lead smelter. JFM is listed as "teacher or usher" at the age of 16 so showing some academic achievement. By this time, James Michell, JFM’s uncle, is now a lead and copper mine proprietor living near Bristol where he was setting up his copper recovery business – and where he went bankrupt. JM moved his operations to Alderley Edge in 1857, setting up the Alderley Edge Mining Company Limited in 1859. JFM was still in Gwennap at this time as he appears in the 1861 census living with his uncles Joseph and Richard and Mary J Michell (b.cir. 1836) who may be his cousin, the daughter of Edmund Michell, who was living next door in 1851. In 1861, JFM was a commercial clerk in the copper trade. In 1862 and 1863, there are references to JFM at Alderley Edge as (previously noted) so we can assume that he moved, at least temporarily, to the Manchester area. By 1867, he had met and married Hannah Hordern and in 1871 is listed as a Railway Clerk living with his widowed father-in-law James Hordern and sister-in-law Harriet. This connection between Manchester and Cornwall has not been proven but is very probable given that James F Michell in Manchester was born in Gwennap. Neither JFM nor Hannah appear in the 1881 census (or the transcription is missing or very corrupt) but in 1891 James F and Hannah are living alone in Hulme (13 Sidney Street) and JFM is listed as an Accountant’s Clerk. Neither JFM nor Hannah appear again but there is an entry for James Frederick Michell’s death registered in Chorlton, Manchester in quarter 2 of 1900 at the age of 60. Obtaining the marriage and death certificates would yield more information for anyone wanting to delve further. There is an entry for Hannah Machell [sic] dying in Q1 of 1900, also registered in Chorlton, so it is highly probable that husband and wife died with a few months of each other. Mine agent in 1860s. Named as Captain in Mining Journal in 1863 and 1864 and probably successor to Jonathan Down. He was also manager of the East Alderley Edge Mine (Mottram Mine) in 1864 and 1865. Captain of the Mottram St Andrew mine in the 1860s. In 1851, he was a copper miner at Calstock in Devon. He had married Mary from Mary Tavy. Living in Kirkleyditch in 1861 and described himself as mining agent. Mine agent in 1860s. Born in Mary Tavy, Devon, he was a copper miner at the age of 11 in the 1851 census for Tavistock. Named in Mining Journal 1860, p.686. Lived in Great Warford in 1861. Charles Procter was a Macclesfield solicitor who became Chairman of the Alderley Edge Mining Company Ltd when it changed hands in the mid-1860s. He also signed a receipt and share certificates on the Mottram St Andrew Mine as Chas. Edw. Procter for Secretary in 1861 and 1862. The Share certificates show that James Michell was a Director of the Mottram St Andrew company at that time. It may be no coincidence that he was a Governor of the Kings School Macclesfield which owned property at Mottram St Andrew at one time. He was born about 1834 and his father was Edward Procter, also a Macclesfield solicitor. He was articled as a clerk to "E. Procter of Macclesfield", his father, in 1856 when he was 22. Charles P married Ellen Livesey (of Fairfield, West Derby, Liverpool) on 27 January 1859 where John M Procter was a witness. It is possible that his father had already died. He had six children: Ethel Marian (c. 1861), Frederick James (c. 1864), Henry Edward E. (c. 1866), Arthur Percival (c. 1868), Robert Cecil (c.1870), Francis E. (c.1873). In 1867, he was living in Ashfield House, Macclesfield, when he became a shareholder of Macclesfield Brewery and Wine Company. He was working as a solicitor in 1871 in Southport where he lived with his wife, Ellen, five children and three staff but died 23 September 1873 at Southport at the age of about 39. He left a will and estate of around £600. His widow also died young in December 1882 at the age of 45. He had a brother, John Mathias Procter (b. c.1836) who went into the church and a sister, Elizabeth S Procter (b. c.1846) and may have had further siblings. His son Henry went on to be knighted and to receive the CBE. Another of his sons was Dr Arthur Percival Procter who emigrated to Canada in 1886 at the age of 21. It is possible, though slightly odd, that his youngest son, Robert Cecil Procter, was an Able Seamen living in a Seaman's hostel in 1891. A detailed history of Charles Roe and his industrial enterprises has recently been published in Dorothy Bentley-Smith's excellent book A Georgian Gent & Co. - The Life and Times of Charles Roe [ref] but the summary below should help if the reader’s interest is primarily with Alderley Edge. An earlier account is available in W H Chaloner’s papers [ref & ref] supplemented by Stella Davies’ book A History of Macclesfield [ref]. I am indebted to Dorothy Bentley-Smith for her assistance in this item. Charles Roe was born in 1715 and died in 1781. He was born in Castleton, Derbyshire on 7 May 1715 as the son of the Thomas Roe, vicar of Castleton. Thomas Roe had investments in lead mines in the Castleton area so Charles would be familiar with mines and mining. Thomas Roe died in May 1723. >Circumstantial evidence suggests that after his mother's death in Stockport 1724, Charles moved to Macclesfield with his elder brother William and sister, and attended the town's Free Grammar School. Apprenticed to a button merchant, Charles worked hard and bought property, allowing him Burgess status in the Corporation. He built the town's first big spinning mill 1743-44 with his father-in-law, and in 1748 a large spinning mill, containing Italian machinery, with several partners. In 1758-59 through family and other connections, he built a copper smelter on Macclesfield Common, relying on his leases of the Alderley Edge and Coniston copper mines effected some two years earlier. His brother-in-law, Rowland Atkinson, headmaster of the grammar school, invested in the business and the company operated under the name of Charles Roe & Co. In partnership with Brian Hodgson, owner of collieries at Disley in Cheshire, he established an industrial village known as Havannah in 1763 where they manufactured copper wire, copper and brass sheets and bolts. Another site at Bosley was established in 1766 where copper was hammered and rolled and brass was rolled. Both these sites were powered by water. In 1774, together with twelve other partners, Charles Roe established a separate company for the smelting side of the business called The Macclesfield Copper Company. Alderley Edge is named as one of the sources of copper ore and Charles Roe’s men are supposed to have "opened the tunnel in the Brynlow dell, with the view of drawing off the water which was lodged in the bottoms of the old shafts. They kept twenty or thirty men at work, and for a time got a considerable quantity of ore, so much, it was said, as to give them a clear profit of £50 a week”. This implies quite an undertaking and evidence of it can still be seen in Brynlow Mine but other sources of copper were also becoming available including Parys Mountain (the Mona Mine) where Roe & Co leased the mine in 1764 and the major find of copper was said to have been made in 1768. This must have been the death knell for Alderley Edge as part of the change in arrangements was the construction of a new smelter at Liverpool in 1767 although copper was still shipped to Macclesfield for finishing. It is normally stated that Roe worked the Alderley Edge mines between 1758 and 1768 or 1770. The mines at Alderley Edge may also have been worked after Roe’s time but by the company in 1788-91. It was in Brynlow that one of the miners carved his initials, JW, in 18th century style, along with the date 1764; according to one source, this was Josiah Wagstaff, brought in to sort out drainage problems. The company continued to operate with new partners joining until 1811. Roe married three times to Elizabeth Langford (m.1743), Mary Stockdale (m.1752) and Rachel Harriott (m.1766). He died at Macclesfield in 1781 and was buried in Macclesfield where a monument was erected in Christ Church. He was succeeded in business by his son William Roe (1746-1827) who kept the copper and brass works running. However, in 1785, the Parys Mountain lease was not renewed. In the late 1780s and early 1790s, Roe & Co issued their own copper halfpennies which were struck for them in Birmingham. 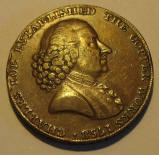 A similar coin was issued in Ireland where Roe & Co also had interests. These coins still turn up periodically (it is said that 11 tons of them were made). Roe & Co also moved their smelter from Liverpool to Neath in this period and the Macclesfield factories were advertised for sale in 1801. Chemist or mineralogist with the 1918 company. Samuel Rowe Sanders was one of the first three Directors of Alderley Edge Mining Company Limited. He was born around 1820 and on the 1851 census, he was an Iron Works Cashier at Kimberworth in Yorkshire, living with Sarah Sanders and Grace Geach, who was an 8 year old scholar at the time. Sarah was born in St Austell in 1806 and they married in Bodmin on 19th June 1848. Although part of the Alderley Edge Mining Company board, no trace of him is seen on 1861 or 1871 censuses. However, his wife appears on the 1861 census living with James Michell at Westbury-on-Trym outside Bristol at The Hermitage. She then appears on the 1871 census in Cornwall named as Anna Geach's sister. In all cases, she is not described as Widow and in the 1871 census she is described as Accountant's wife. The implication is that Samuel Rowe Sanders might have been outside England at the time. In 1881, Samuel Rowe Sanders is in Plymouth and dies the same year on 10 September. His will leaves £1960 and it is shown that his full name was Jonathan Samuel Rowe Sanders. Samuel Rowe Sanders was brother-in-law to James Michell’s wife. It is probable that this is the same Samuel Rowe Sanders who was trading with John Pickering as Brinsworth Waggon Works near Rotherham. They were adjudicated bankrupt on 1st August, 1863 which was annulled in 1869. That Samuel Rowe Saunders was described in one case as cashier and in another as accountant suggests that he was what would now be described as Financial Director to the AEMC. Employee of Charles Roe. May have left the initials JW 1764 in Brynlow (but see also the page on apotropeic marks). A Josiah Wagstaff was baptised on 26 June1718 at Winster parish church in Derbyshire with father George. The Will of George Wagstaff, blacksmith of Winster, 1728, mentions his son Josiah. George refers to groves, lead mines and mineral rights in his will. In the 1760s Parish records in Middleton in Teesdale, there was a Josiah Wagstaff living at Hude with his family. In 1758 several Derbyshire miners and their families went to this area working for the London Lead Company, the well-known Quaker company who also had interests in Winster. Information found suggests that Josiah was the captain of the Derbyshire miners in Middleton in Teesdale. He was buried in the churchyard there on 31 January 1776 and a copy of his will is available from the National Archives. One of the trustees of the will was Anthony Tissington junior of Swanwick, believed to be the son of the mining proprietor Anthony Tissington of Swanwick Hall, Derbyshire.